IOMAX has offered its Archangel Block 3 Border Patrol Aircraft (BPA) to the Philippine Air Force (PAF) as a replacement for its ageing Rockwell OV-10 Bronco counterinsurgency fleet, IHS Jane's was told on 2 June. The US defence company has submitted a bid to the Philippine government, in which it is pitching the Archangel as a replacement for the PAF's nine remaining OV-10s, which were acquired second-hand in the 1990s, IOMAX CEO Ron Howard disclosed during a visit to the company's North Carolina headquarters. "IOMAX has previously done signals intelligence in Southeast Asia, and so we know the region. The Philippine mission is very well suited to the Archangel," he said. The Philippine requirement was formally launched in mid-May, when the Department of National Defense (DND) issued tender documents to acquire six close air support aircraft and an accompanying logistics support package for PHP4.968 billion (USD114 million). In its documents, the DND noted that the selected bidder must have had prior experience of such programmes over the previous decade, and that the selected platform should already be in service with the armed forces of the country of origin or by the military of at least two other countries. Although the Archangel BPA is regarded by some (the US Department of Defense included) as being an essentially new platform, it is in fact the third iteration (hence the Block 3 designation) of the Block 1 and Block 2 AT-802 that IOMAX developed and supplied to the United Arab Emirates (and which it still supports). Also, with the Block 1 also now in service with Jordan, the Archangel does fit the criteria for selection as laid down by the DND. While the DND did not publically disclose aircraft specifications, IHS Jane's understands that they have been written up with the Embraer EMB-314 Super Tucano in mind, with requirements that it be equipped with retractable undercarriage and ejector seats, among other things. The Archangel currently features neither of these, but Howard told IHS Jane's that IOMAX has done studies with Martin-Baker on the feasibility of replacing the current crash-resistant seating and roll-cage with twin ejection-seats and bubble canopy, and that this is perfectly doable (the United Arab Emirates is also said to be interested in the canopy for a potential follow-on order of aircraft, but not the ejection-seats). As for retractable undercarriage, Howard said the mission did not require it, and the weight penalties and rough field limitations would outweigh any benefits over the current fixed undercarriage, and so this would not be offered. As retractable undercarriage is not being offered as an option, Howard said the company's designers were looking at a number of aerodynamic improvements to the Archangel that would help it close the speed gap from its current 180 kt cruise speed to bring it closer to the 220 kt of platforms such as the Super Tucano. From spinner to tail, these enhancements include the option of an enhanced propeller with a scimitar-style composite blade; a sleeker nose profile; angling the exhaust rearwards to provide about 200 lb of additional thrust; speed fairings on the main undercarriage and wheel struts; remodelled wing roots and tips; blending the rear of the cockpit to the tail section to reduce buffeting and drag; remodelled tail and stabiliser roots and tips; and a more generally cleaned-up fuselage, with as few protruding parts as possible. According to IOMAX's chief scientist, Ray Nielson, who is leading this improvement effort, these modifications should increase the aircraft's cruise speed to about 210 kt. Even so, Howard was keen to note that speed is not everything, and that rival platforms had sacrificed much in terms of payload and range/endurance in order to go faster. With a typical mission profile of 175 kt outbound to a range of 1,350 n miles, six hours on station, and 175 kt inbound to base, and all with a maximum gross take-off weight of 6,715 kg, the Archangel can cover more of the Philippine's area of operations with a greater weapon load than any of its competitors. At just USD8 million per aircraft (without options), the Archangel is also cheaper than many of its rivals ( IHS Jane's All the World's Aircraft gives the Super Tucano a unit price of USD12-13 million). With the DND's tender documents now released, all bids must be submitted by 11 June, with the selected platform expected to be with the PAF 18 months after contract signature. 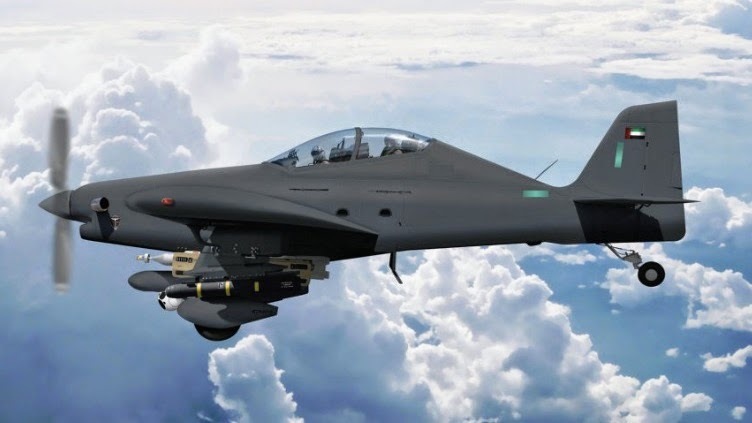 Besides the Archangel and Super Tucano, other platforms expected to compete include the Beechcraft AT-6 Texan II, and perhaps even the Pilatus PC-21.